In order to keep your medical record private and confidential, we need a unique identifier in our database that doesn't change. We already have an existing subscription for you in our system. We have sent you an sms/email with your username and password. 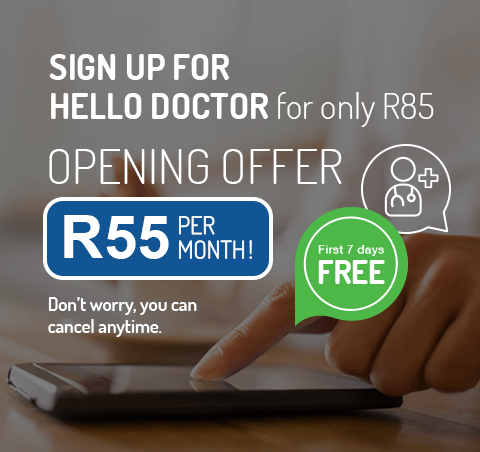 Hello Doctor is an electronic sales platform designed to promote a better understanding, knowledge and awareness of health care, acting as an interface between yourself (the “User”) and health practitioners in South Africa; presenting you with a greater choice of and access to various health care topics, as well as the opportunity to communicate with registered medical practitioners to discuss all your health care related questions. These services may be reviewed, updated, added to and/or removed by Hello Doctor from time to time, meaning that the above list of services is not exhaustive and that this definition will be varied from time to time to bring it in line with the current services offered by Hello Doctor. The Hello Doctor Services are not intended nor suited to be a replacement or substitute for professional medical advice, consultation, examination, diagnosis or treatment relative to a specific medical question or condition. All information obtained by a User on, through and/or by means of the Hello Doctor Services, is for informational and educational purposes only. HOW DO I SUBSCRIBE FOR THE HELLO DOCTOR SERVICES? The User will not be entitled to access of a Hello Doctor Service for which the User is not subscribed to and/or has not paid for. The User will be required to accept these terms and conditions, which includes the Terms and Conditions of Use, before subscribing for the services. All subscriptions are subject to the approval of Hello Doctor in its discretion. Hello Doctor will have the unfettered right to accept or reject an offer for any of its services, made by a User. Hello Doctor will be entitled to take steps to restrict or suspend the services to a User who misuses the Hello Doctor services. Users subscribing to the Hello Doctor Services (except Users subscribing through a Third Party Benefit Programme who have free use of Services at all times) will be given a 7 (seven) day free trial period. Should the User wish to continue with the Hello Doctor Services after the free trial period, then subscription fees will become due from day 8 (eight) being the day following the free trial period. the Subscription Channel through which the selected service is subscribed for; and/or the selected service subscribed for. conditions, including availability and limited-offer stipulations. information is not as represented and warranted. are provided on an “as is” and “as available” basis. whether provided by Hello Doctor or a third party. paid in advance and prior to making use of the selected Hello Doctor Service. time to time be provided for by Hello Doctor. made by means of multiple submissions as and when the User has airtime available. Hello Doctor for the use thereof. Doctor Website and/or on the Hello Doctor App. for so long as the Third Party Benefit Programme has paid for such service. for the purposes set out herein, which Hello Doctor is entitled, but not obliged to do. to the selected Hello Doctor Service. of its rights under or by virtue of this Agreement. mitigate against the occurrence and/or consequences of that event or circumstance. contemplated or provided for herein. selected service beyond Hello Doctor’s reasonable control. negligent acts or omissions of Hello Doctor or any of its affiliates. associated with the provision of the selected service to the User. to in writing by Hello Doctor. construed as a waiver of any subsequent right, obligation or default. under the same or a like liability, whether joint and several or otherwise. Agreement will remain and be of full force and effect. Hello Doctor provides a transparent online resolution procedure for settling disputes. jurisdiction in which he or she operates. jurisdiction of the South African courts for any matter that may arise relating to Hello Doctor. bearing on the services to be so provided. to see; there being no confidentiality in open forums. reason for your call persists. the appropriate course of action for your particular healthcare problem. that of your family member requiring the services. or suitability of the services and/or the products so provided. or wrongful conduct by you or any other person acting on your behalf. making use of these services or otherwise. The voucher value will be deducted below.